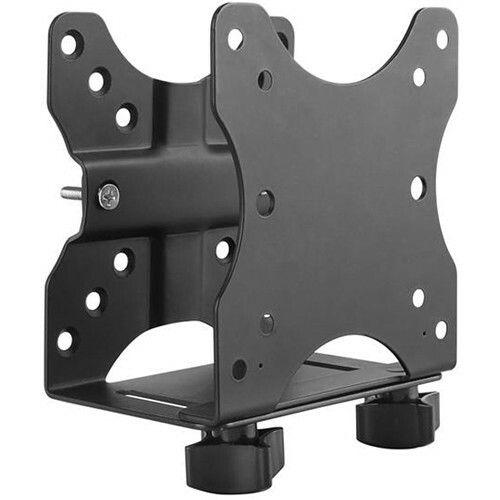 Mount your thin client computers or docking stations that extend from 0.7 to 2.8" and weigh up to 11 lb with the Thin Client Mount VESA Mounting Bracket from StarTech. This mount is designed to save space and reduce cable clutter by attaching your device behind or under a monitor with its 75 x 75 to 100 x 100mm mounting patterns. You can even use it to attach onto monitor-mount poles. This mount features rubber pads that are designed to prevent damage to your connected device. Furthermore, the Thin Client Mount VESA Mounting Bracket has an adjustable strap that keeps your device secure while the open-frame design provides easy access to the computer. The versatile double-sided VESA mount offers several installation options, which enables you to mount your thin client PC or dock to the back of your monitor or under your desktop, or clamp it to a monitor-mount pole. The bracket supports 75 x 75mm and 100 x 100mm VESA mounts, making it suitable for most monitors and monitor mounts. This adjustable mount is ideal for holding an Intel NUC, Mac Mini, most small CPUs, thin clients, docking stations, or USB hubs that fit within the width adjustability of the mount 0.7 to 2.8". The mount can support up to 11 lb. It also features an adjustable strap to help keep your devices secure, and rubber pads to secure products with non-parallel surfaces. Create a clutter-free work space in your office, business, commercial, and institutional environments. Enhance your home office by maximizing your desktop space. Note The adjustable mount is designed for holding small CPUs, thin clients, docking stations, or USB hubs that fit within the width adjustability of the mount: 0.7 to 2.8" (17 to 70 mm). Box Dimensions (LxWxH) 7.0 x 5.2 x 3.9"